Simple dinners are sometimes the best ones! This was a really simple soup I put together for John recently when he wasn’t feeling so hot and it was perfect! It really hit the spot and was a snap to make! The key was using homemade chicken bone broth that I had made the day before. It’s exactly what you want to eat when you’ve had a busy day of Christmas shopping, errands or have been over indulging a little too much! Good old comfort food! You can certainly use store bought broth for this, but the final flavor really depends on the quality of your broth. If you wouldn’t want to drink your store bought broth by itself, it probably won’t be tasty enough to use in a simple soup like this. Consider making your own if you can, it’s so very good for you and tastes so much better than anything you can buy. I have a recipe here which is good base. On this particular day, instead of the carrots and onion in my regular broth, I added the dark green parts from a couple of leeks and the fronds from a fennel bulb (both of which I had saved and put in my freezer for the purpose of making stock). It came out really good! Good quality stock and a few simple ingredients and dinner is done. You can throw almost anything into some good homemade broth and it will taste good. I love adding a huge chunk of fresh turmeric (grated) to it – it adds a ton of rich color and an earthy flavor. Preheat oven to 375 degrees. Wrap peeled sweet potatoes in foil and place on one side of a large cookie sheet. Put the split chicken breasts on the other side of the cookie sheet. Bake both for 45 minutes. Remove from oven and set aside for a few minutes. In a large stock pan or dutch oven, bring the chicken broth to a simmer and then add the bok choy, rosemary, celery and turmeric. Continue simmering for 10 minutes or until the celery is tender. When the chicken is cool enough to handle, remove the meat from the bones, cut into bite sized pieces and add to the soup. Open the foil packets and chop the sweet potato into bite sized pieces and add to the soup. If the sweet potato is still somewhat firm, let the soup continue simmering until it is soft, otherwise just cook until everything is warmed through. Add salt and pepper to taste and serve! 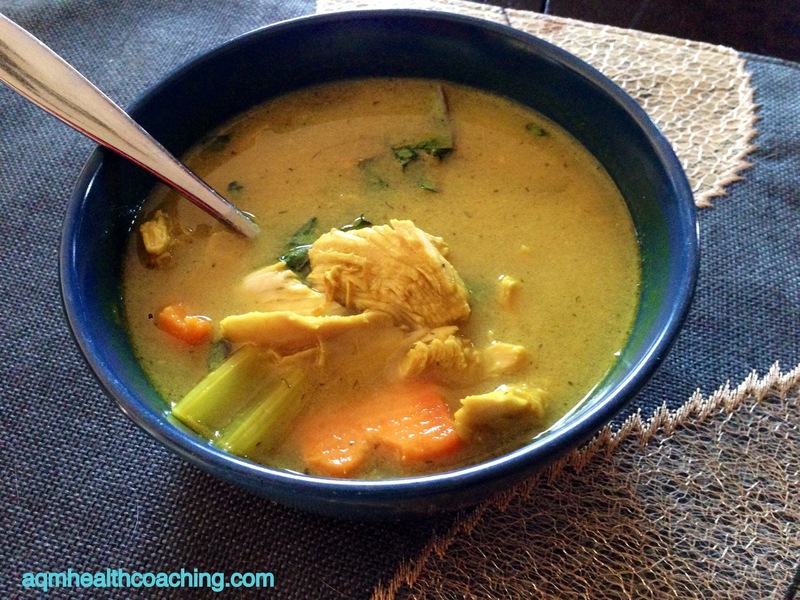 This entry was posted in Dairy Free, Gluten Free, Recipes, Tree nut and Peanut free and tagged chicken soup with bok choy, fresh turmeric, recipes, sweet potato and boy choy soup on December 8, 2014 by Andrea Quigley Maynard.